This is the first in a new series of short posts showing scenes from Great War London with the same location today. 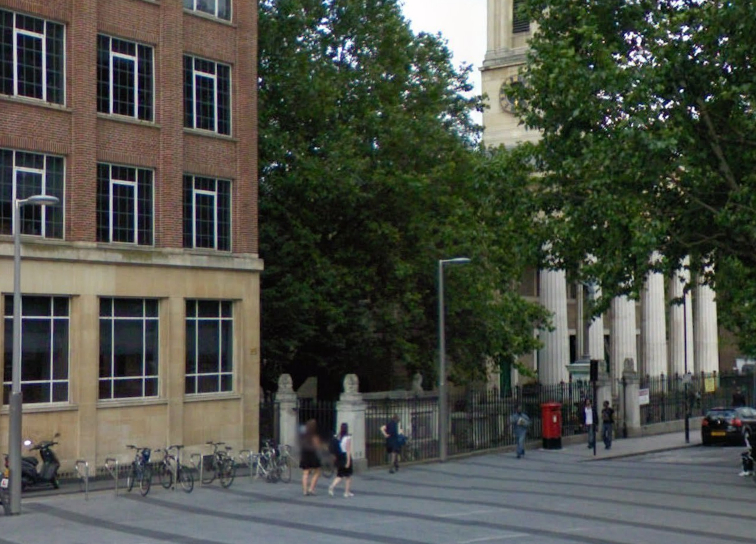 The new building on the left (KCL’s James Clerk Maxwell building) is closer to the church than its predecessor was, and there are no longer public toilets under the road, but you can still clearly see where the YMCA building was. 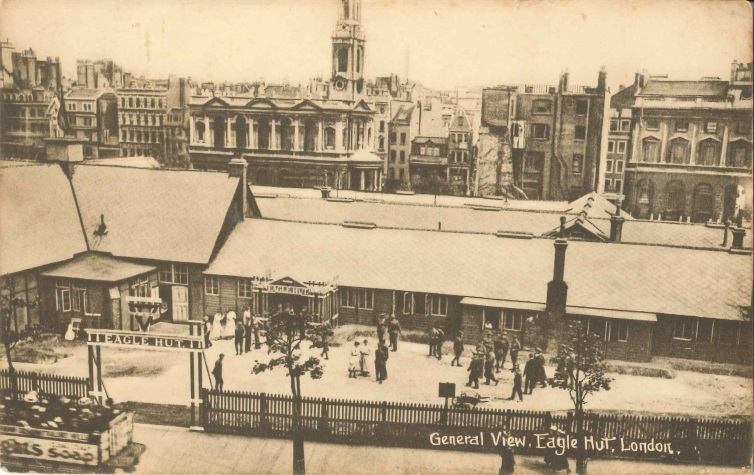 The “Eagle Hut” on Aldwych was the home to the American YMCA and used by thousands of Americans in London in 1917-1919. Those visitors could buy and send postcards of the Hut. One of these postcards was sent by George Donald Preece to his wife Doretta in Brooklyn, New York. The American YMCA ‘Eagle Hut’ in Aldwych. This is the center of YMCA activity in London. It is packed to the doors with soldiers and sailors. This sure is a busy burg and we are on the go. The YMCA men and women are wonderful and do every thing possible for us. Wish that I had you with me. 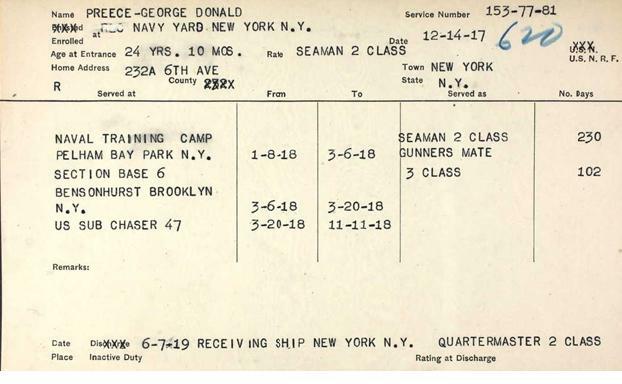 George Donald Preece was serving on the US Navy’s Submarine Chaser 47. After enlisting in December 1917, he was in training from January to March 1918 and was mobilised on 20 March. He served on US SC 47 for the remainder of the war. He born in January 1893, the son of George William Preece and his wife Matilda. George senior was in fact from London, having been born in North London in 1871 and went to New York in July 1887, where he was working as a machinist when he became an American citizen two years later (and briefly served in the National Guard in 1898). Matilda was born in New York but her parents were both born in Germany. In 1900, the family lived on Warren Street, New York: George and Matilda with their children Matilda, George, Helen and Gertrude. Like so many Americans, George D Preece found himself in Europe to fight against one of his ancestral homelands. 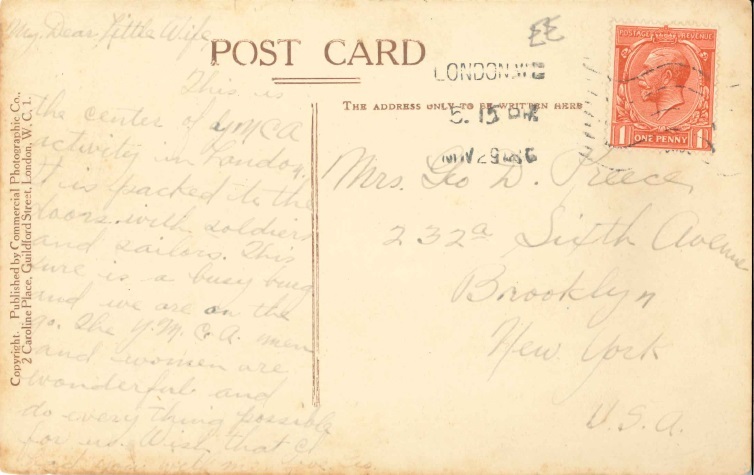 When he sent the postcard, though, he was in his father’s hometown of London. When he registered for the draft in June 1917, George D Preece was an unmarried timekeeper, living at 443 54th Street, New York, and working for C.W.Bliss on neighbouring 53rd Street. That December, though, he married Doretta May Heyl, the recipient of this Eagle Hut postcard, then living at 232a Sixth Avenue, Brooklyn. George returned home to New York after being demobilised in June 1919 and in 1925 the couple were living at 1979 Troy Avenue, Kings, Brooklyn. They had two daughters, Dorothy in 1919 and Norma in 1923. They were still living there in 1941 when George again registered for war service. Doretta died in 1968 and George in 1970, after over 50 years of marriage.